FINAL SPACING: 20 to 30 feet if you really want to. It comes up from seed all over the place. NATURAL HABITAT AND PREFERRED SITE: Native to China but has naturalized all over the United States. IDENTIFICATION INFORMATION: Very upright, fast-growing tree with large compound leaves and distinctive seed pods in the fall and winter. FLOWERS AND FRUIT: Flowers form in the spring, April through May, in large loose panicles 6 to 12 inches long. Male and female flowers on the same tree (dioecious), in upright clusters, yellow green, soon after the leaves are fully developed in late spring. Male flowers stink, female flowers disperse large quantities of seed that germinate and sprout all over the place. 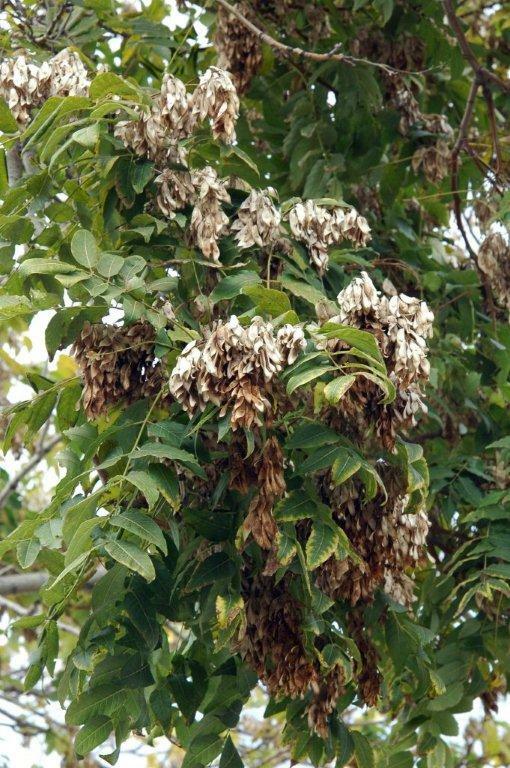 Fruit forms in the fall, September to October, in large clusters of winged seed that hang on the tree for a long time, propeller shaped with a central seed cavity. BARK: When young, smooth and light gray to tan, becoming a dark gray and slightly rough and fissured with age. FOLIAGE: Leaves are alternate, deciduous, compound, reddish-green becoming darker green during the growing season, yellow in the fall. CULTURE: Almost an indestructible tree. Will grow where almost no other vegetation will; tolerates high heat, poor soils, heavy winds, polluted air, salty soils, limited soil availability, too much or too little water, and other harsh conditions, etc. PROBLEMS: Can become a real pest by growing so easily from seed and sprouting up all over. Most books say that, unfortunately, tree of heaven has no pests. Wood is weak and brittle making it susceptible to ice and wind storms. PROPAGATION: By seed or suckers. This plant is so easy to grow from seed it will come up cracks in sidewalks, driveways, parking lots, etc. INSIGHT: I’m interested in the tree because it is so easy to grow in such harsh conditions. It is a good tool to improve the air and soil where no other plants can grow.